The second highest use of energy in your home is your hot water heater. For the efficient use of energy and your dollar, install a new energy efficient water heater and be eligible to receive a $50 credit on your power bill. In order to qualify for the UEC rebate the unit that you purchase must have an energy efficiency rating factor of 0.93 for a 59 gallons or less and a 0.91for a 60 gallons or more. Copy of the original receipt for water heater purchase. UEC also offers a $300 rebate for members choosing to install a high efficiency Heat Pump Water Heater in their home. Upgrade to the next generation of energy-efficient water heaters and start seeing a savings of 25–50% on your hot water costs. How does it work? 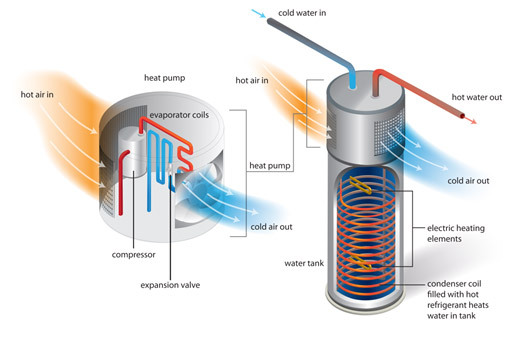 Heat pump water heaters work like a refrigerator, but in reverse – while a refrigerator pushes heat from inside the unit out to the air around it, a heat pump water heater uses fans and an evaporator to pull warmth from the surrounding air and transfers it to water in the storage tank. Learn more about the heat pump water heater and find out if you can save even more with state or federal tax credits by visiting the Smart Water Heat website at smartwaterheat.org. Click on this link to download a copy of the UEC HPWH Participation Form (PDF).